Tandem Fly patterns were developed in the early 1940’s and were used to eliminate short strikes that often occurred with single hook streamers. Dr. J. Herbert Sanborn tied one of the first successful tandem flies when he caught a Salmon on Messalonskee Lake in Maine. The streamer was named the Nine-Three because the fish weighed in at nine pounds, three ounces. These colorful flies are ideal for larger fish that are in constant pursuit of minnows and other baitfish. A tandem streamer will produce solid hook-ups if the materials depict a sizeable fish and effectively cover the trailer. The most effective patterns exhibit a bit of flash, lively motion and proper coloration which will attract even the most discriminating fish. For smaller fish use 2- to 3-inch tandems and use 3 1/2- to 4-inch for larger fish. Standard 9671 2X long hooks are commonly used with a front #4 hook, and for larger fish, a rear #6 hook. The trailing hook can be placed in an up or down position. Tied properly, fish will also strike a tandem fly out of curiosity or anger. To begin, cut a 6-inch length of 25- to 30-pound leader. (Large fish such as salmon or ocean fish may require heavier tests or wire.) Fold the leader in half and push the loop through the eye of a #6 hook. Then slip the loop around the #6 hook bend and pull the end tight. Before you attach the trailer to the #4 hook shank, wrap it with 3/0 monocord so that it won’t slip. Next, on the #4 2X hook, place the trailing leader on top of the shank, so that it extends one to two inches behind it. Finish by making multiple tight wraps back and forth over the leader and then firmly pull on it. If it doesn’t slip, you’re ready to apply materials. The wing should cover the trailer hook. 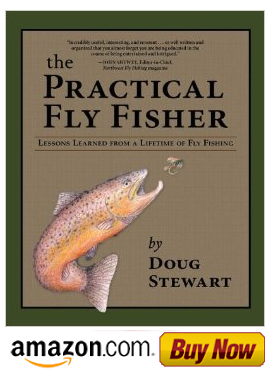 If you like the information on this blog please check out Doug Stewart's new book, "The Practical Fly Fisher: Lessons Learned from a Lifetime of Fly Fishing"
Tying a Scud Fly: "Grass Shrimp"
A Fluttering Stone or an Impostor? Wading Wet for Winter Steelhead? This is a fly fishing companion blog with fly fishing tips and fly tying tips based on a soon to be published book by Doug Stewart. I love to fly fish and tie flies, and I like to talk about it and teach it. Hopefully, this blog will provide a means of continuing to do all of this with people I know and people I hope to become acquainted with through www.flyfishingwithdougstewart.com. I also enjoy writing about my fishing adventures and hope that people will enjoy reading about them. Of course, I am also building this blog to promote my books. My first book, “Tying and Fishing Outstanding Outstanding Flies,” was published in 2006, and my second book, “The Practical Fly Fisher,” is going to be published in February 2014. My dad started taking me fishing when I was about 12 years old, and I have been fishing and floating Oregon and Washington rivers and streams ever since. After teaching school for 15 years, I decided to turn my avocation into a vocation and opened Stewart’s Fly Shop. I enjoyed teaching classes on fly tying, fly casting, fly fishing and rod building for over 30 years. Of course, family vacations with my wife and four sons usually involved fishing and camping. Today, an ideal fishing trip would be drifting the lower Deschutes River and fly fishing for Steelhead and Redside trout with my family and fishing buddies, as well.